Michael Cohen Surrenders To FBI, Now In Custody - Joe.My.God. Multiple outlets are reporting that former Trump lawyer Michael Cohen has surrendered to the FBI at their Manhattan office. He is expected to plead guilty this afternoon to multiple charges, including campaign finance violations. Jail time is expected. The deal could be a significant blow for Trump. 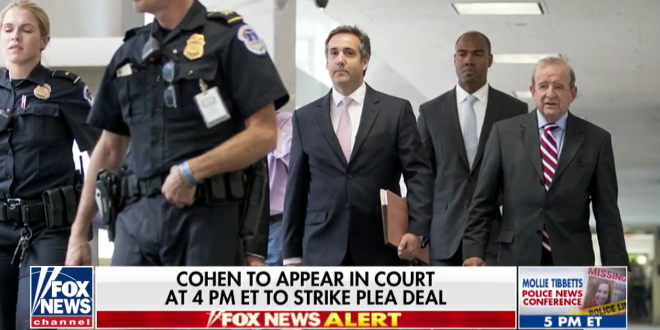 Cohen was part of Trump’s inner circle for more than a decade, working as his personal attorney at the Trump Organization and continuing to advise the President after the election. Cohen once said he would take a bullet for Trump, but the relationship between the two men has frayed since an FBI raid in April of Cohen’s office, hotel room and home.